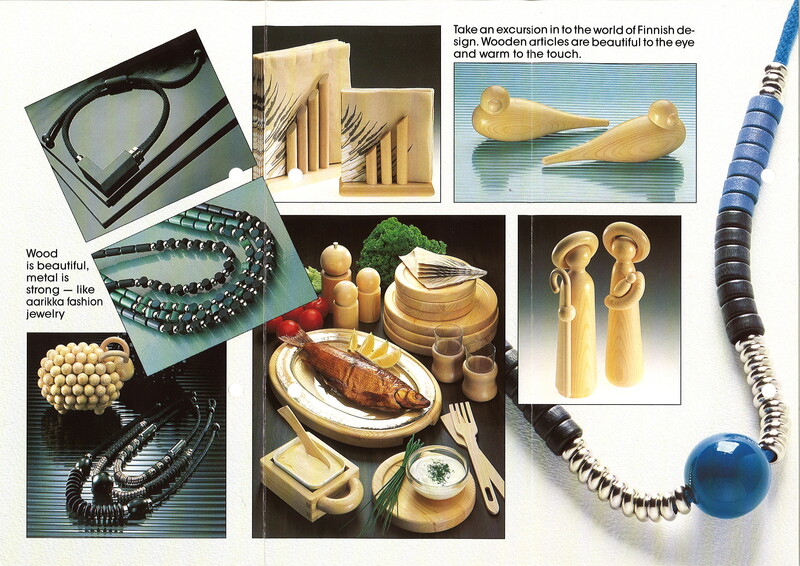 Imposing wooden products of the 1980s. 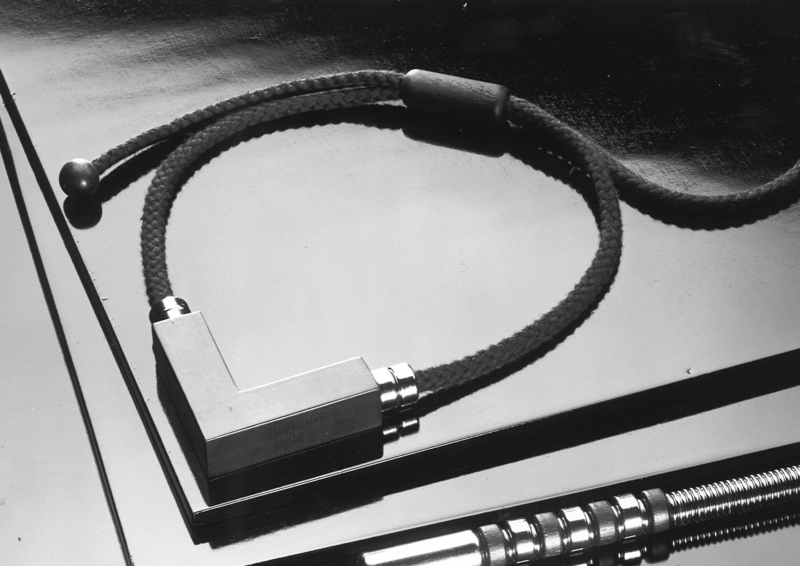 The National Entrepreneur Prize 1984. 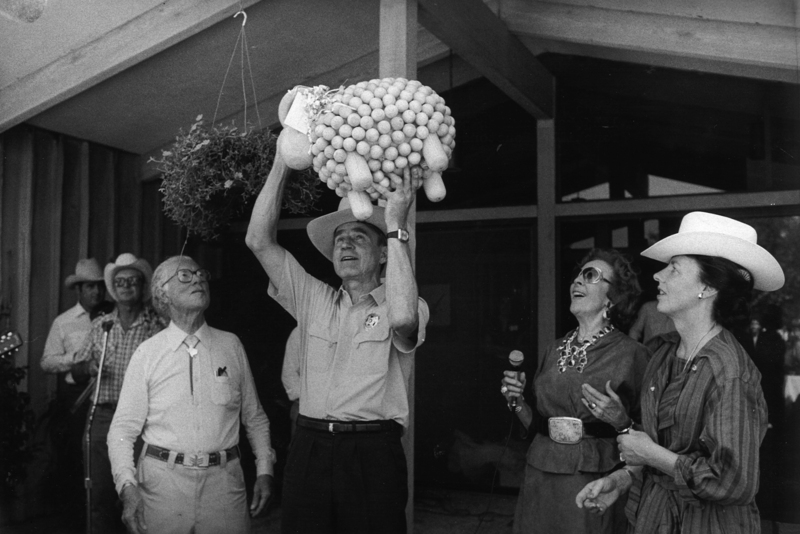 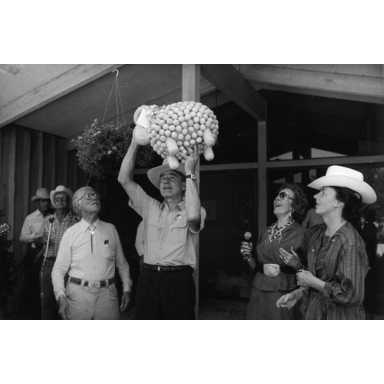 Finland’s President Koivisto presents the Pässi ram figure as a gift in Houston in 1983. 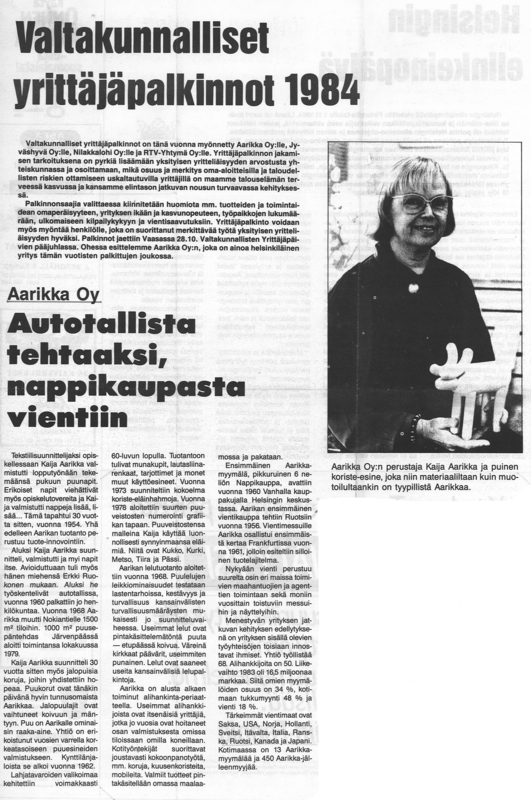 Interview in Maaseudun tulevaisuus, 1988. 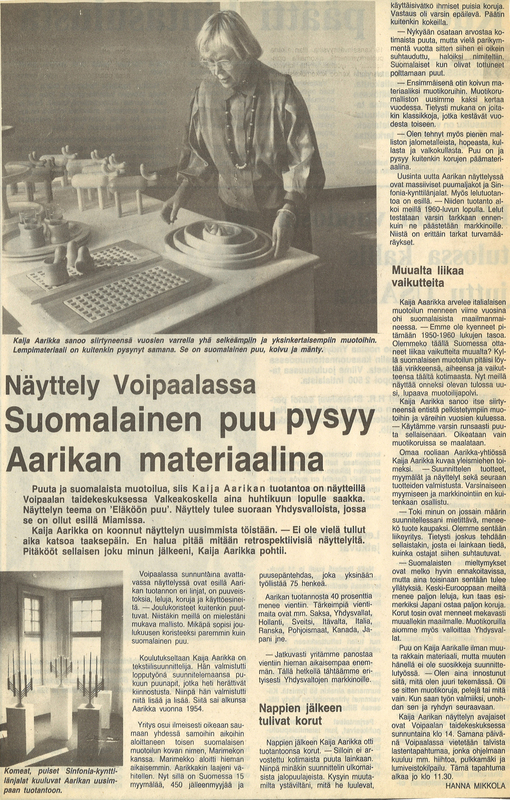 An article in Me Naiset magazine, 1983. 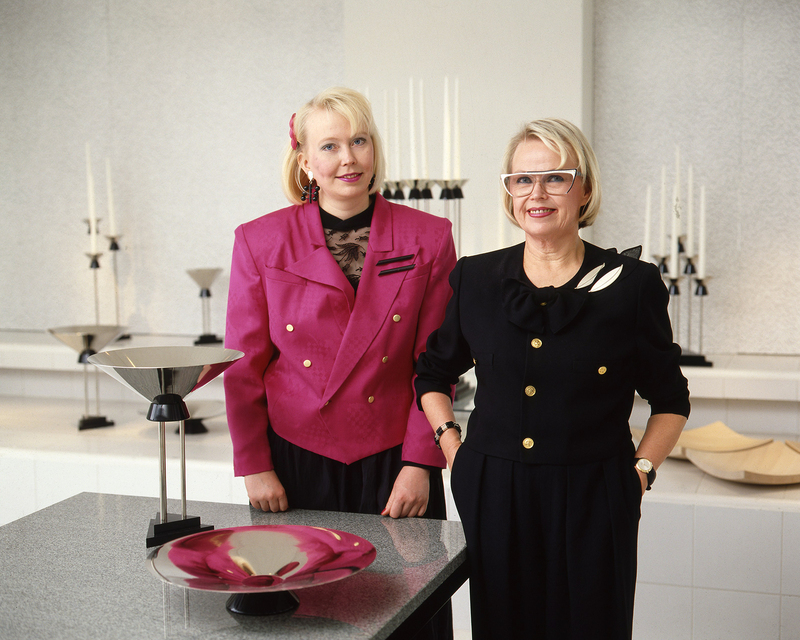 In the 1980s, everything that was big and impressive was deemed beautiful. 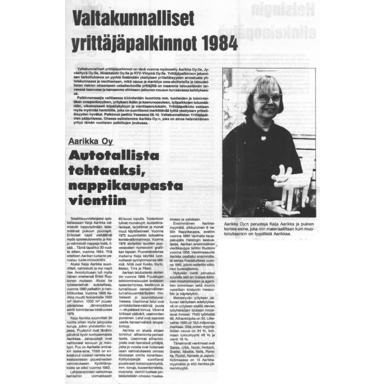 The heat of the economic boom brought a time of intense growth for Aarikka too. 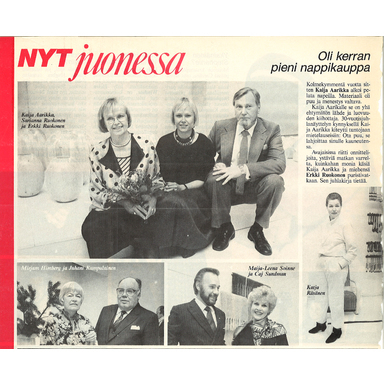 In 1984, the company was overjoyed to receive awards both as ‘entrepreneur of the year’ and for its role as an exporter. 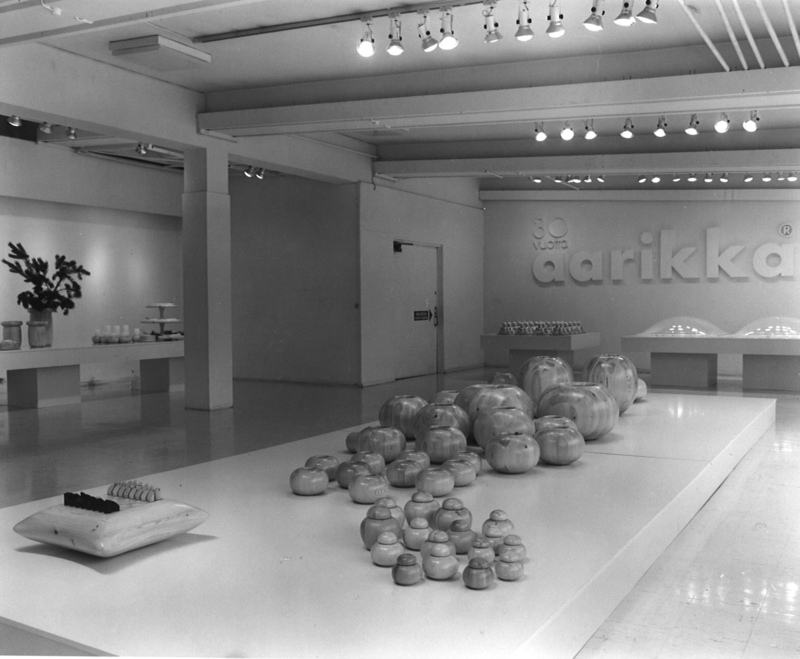 The number of Aarikka shops grew from eight to 20 in that decade. 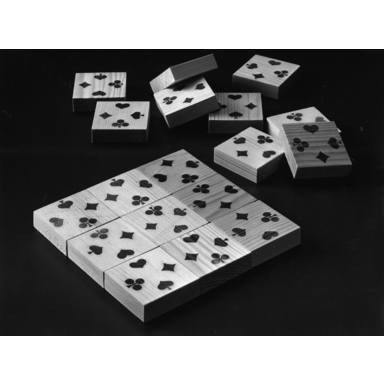 The company had 80 employees and nearly a hundred subcontractors. 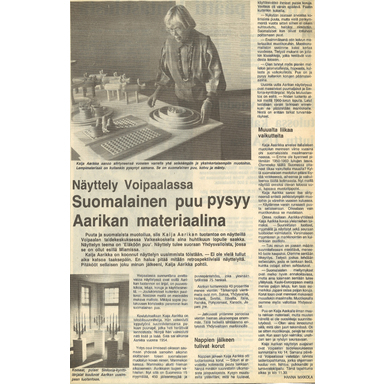 This time in Aarikka’s history would later be remembered as the company’s ‘crazy years’. 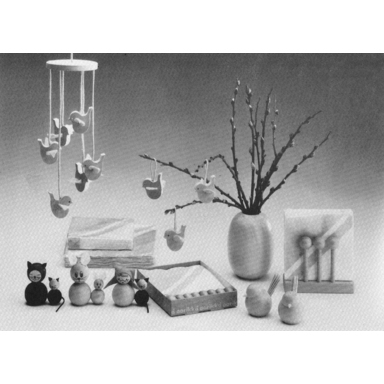 Aarikka’s product range shifted more and more toward decorative products and gift items. 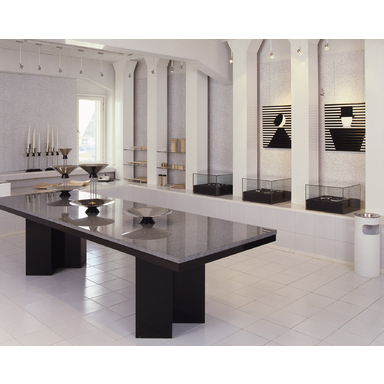 In the spirit of this age of well-to-do urbanites, even the gift items of the time were created in an impressive size. 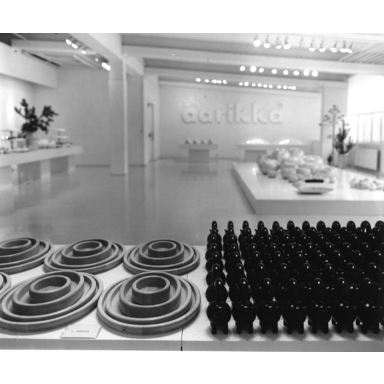 The 30th-anniversary exhibition, at the Finnish Design Center. 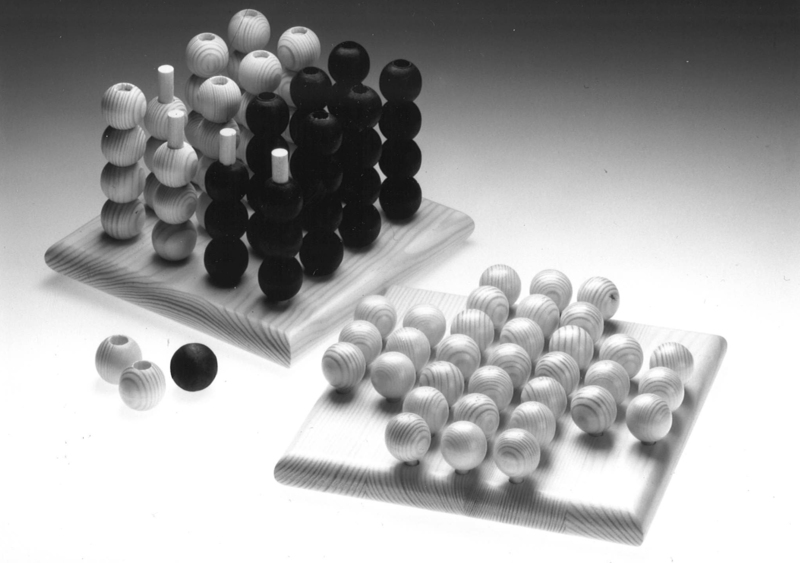 The Shakkilauta chessboard, Juhlarasia boxes, and Anemone vases. 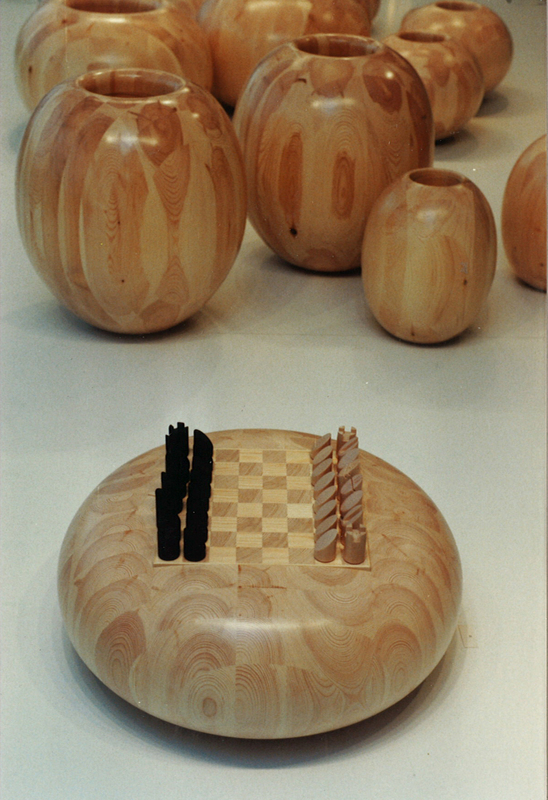 The Pyöreä shakkilauta round chessboard and Sireeni vases. 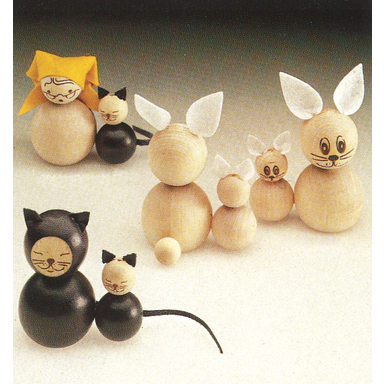 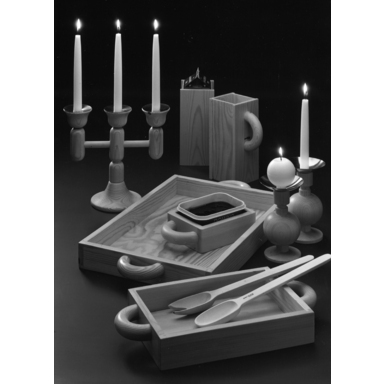 Wooden cats and the Isoäiti tray range. 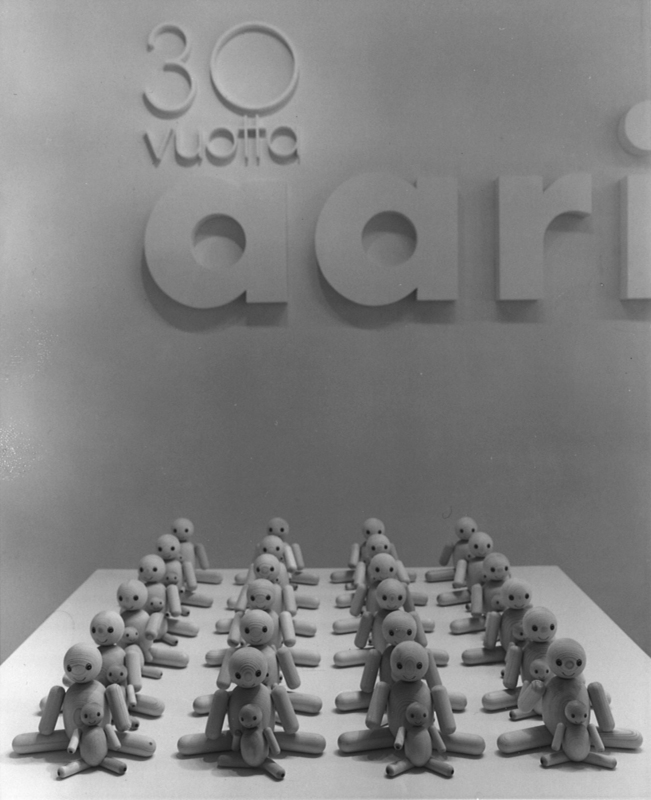 The Minna and Sanna dolls at the 30-year-jubilee exhibition. 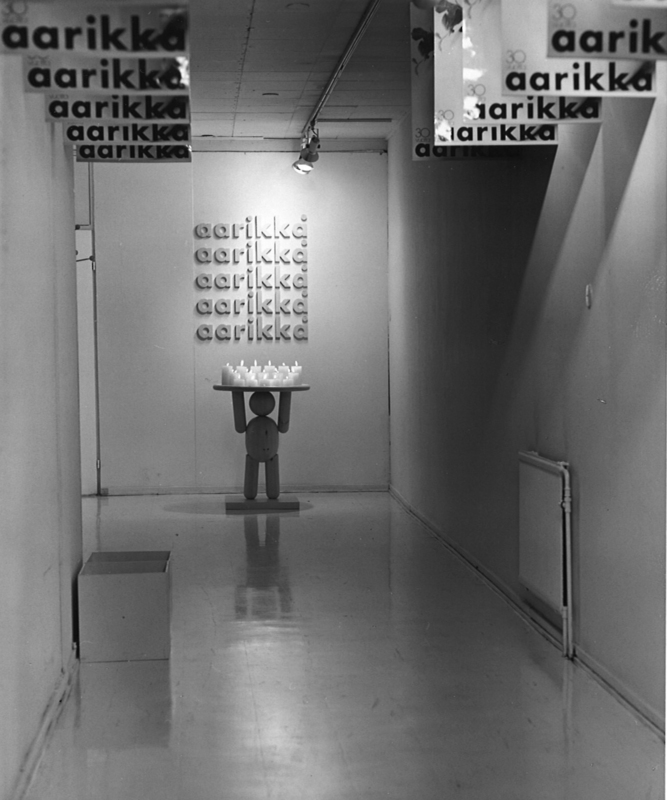 The opening of the 30-year exhibition. 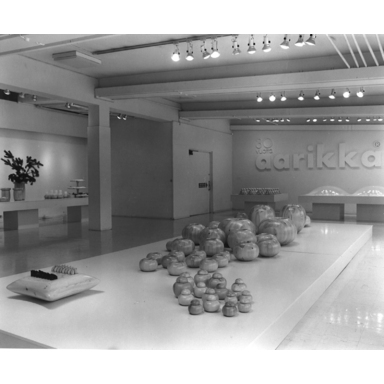 The Eläköön Puu exhibition, held in 1985. 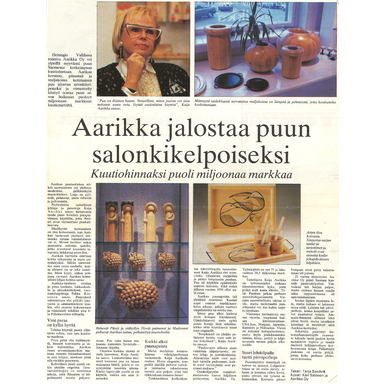 The 35th-anniversary exhibition in Vallila, Helsinki. 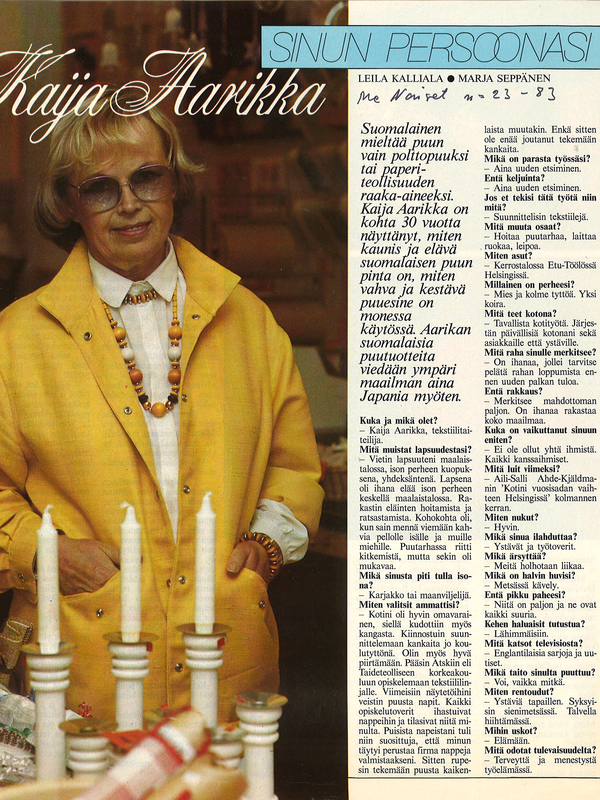 Aarikka celebrated its 30th year with the Eläköön Puu! 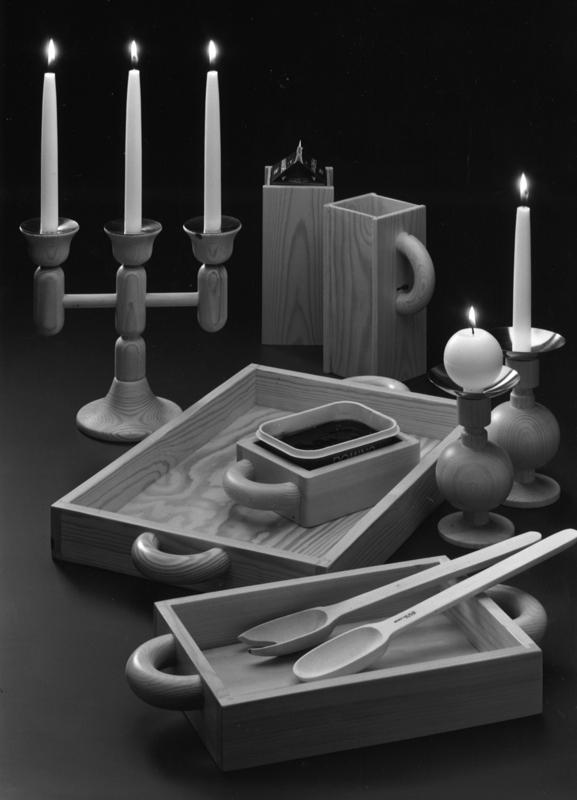 (‘Long Live Wood!’) exhibition at the Design Center in Helsinki. 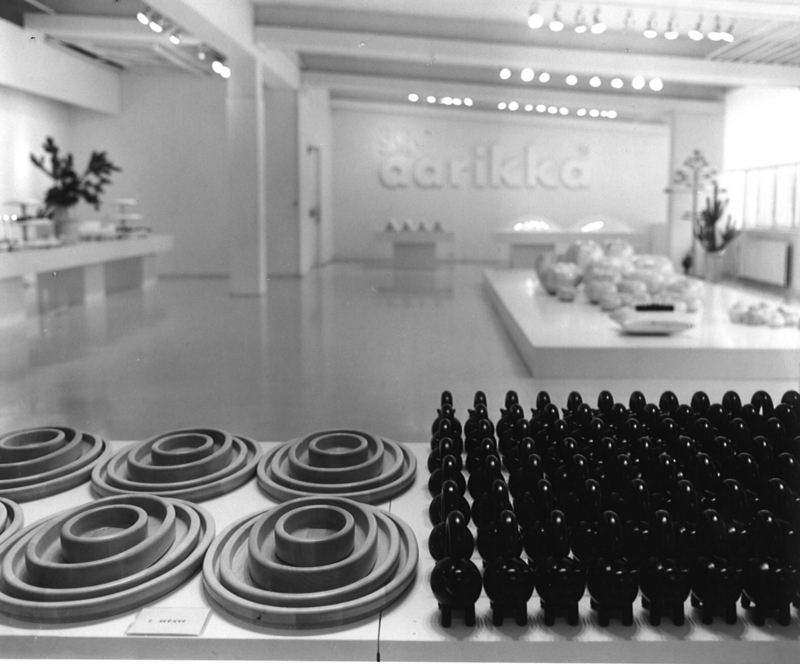 The exhibition featured, for example, large flat wooden trays and massive Anemone vases made from pine. 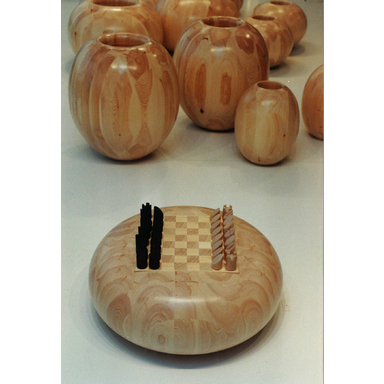 The large chessboard is as plump as a pillow. 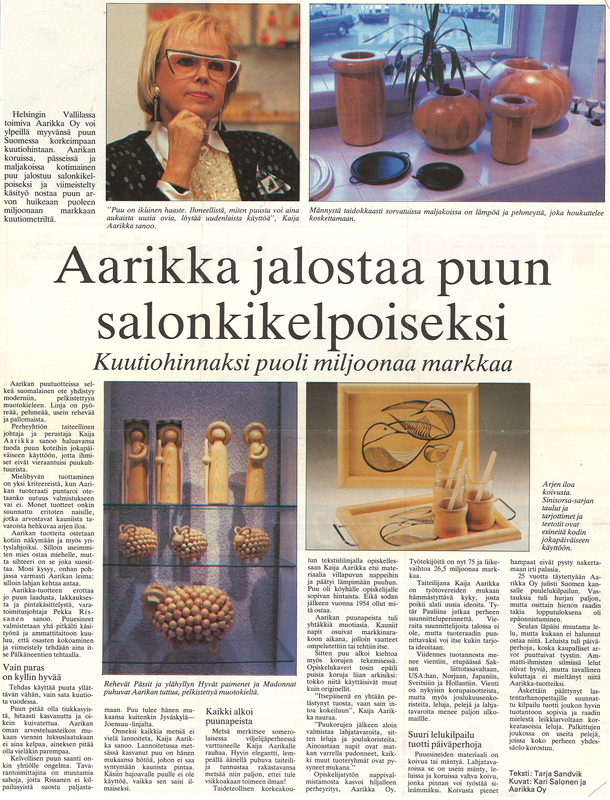 From Helsinki, the exhibition on continued its journey, to the United States, where it visited Miami before returning to Finland, to be shown at the Voipaala Art Centre in Valkeakoski. 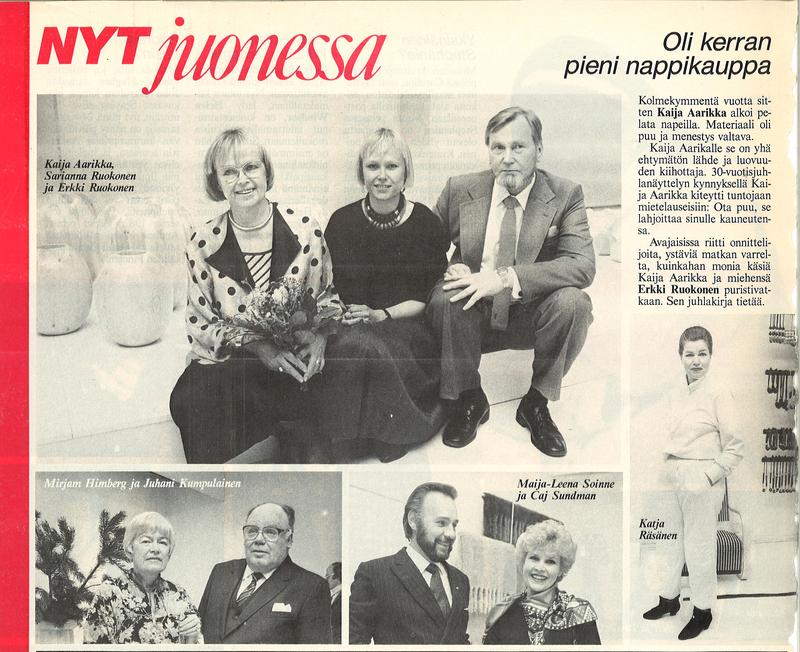 The 35th-anniversary exhibition was held on the company’s own premises, on the road Nokiantie. 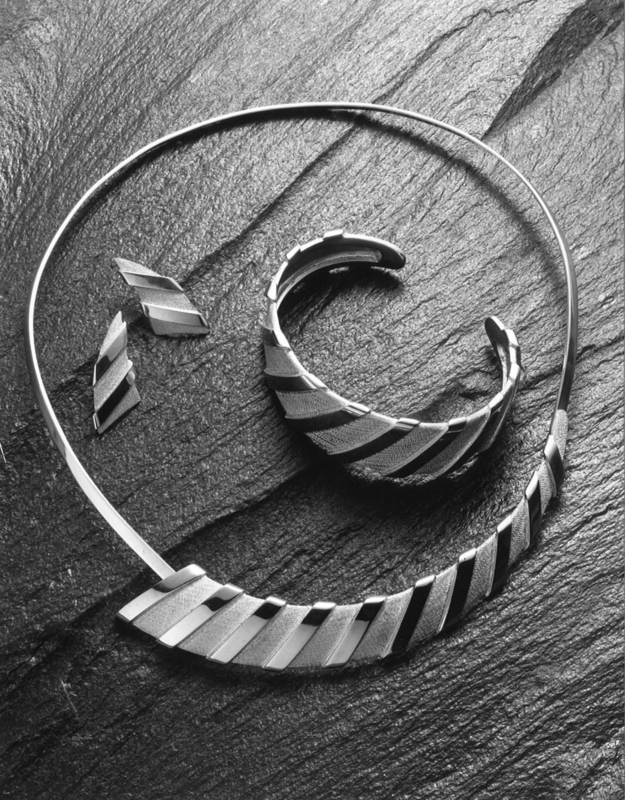 At centre stage are the large wood reliefs and impressive silver and costume jewellery designed by Pauliina Aarikka. 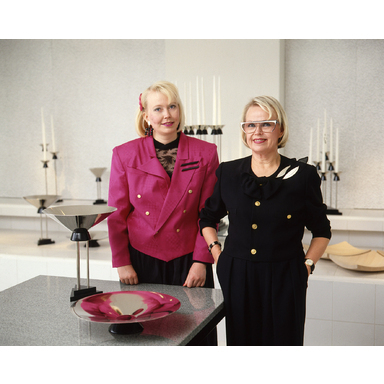 In 1985, Kaija’s glass pieces were on display in New York at the Cooper Hewitt, Smithsonian Design Museum at an exhibition featuring Finnish glass art. 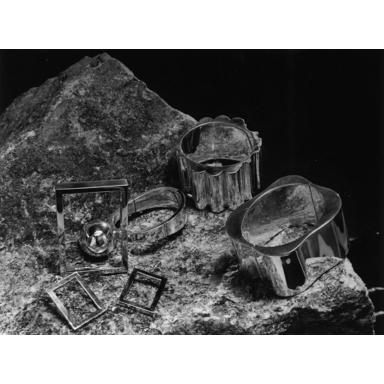 The Pohjantulet jewellery set, made from silver. 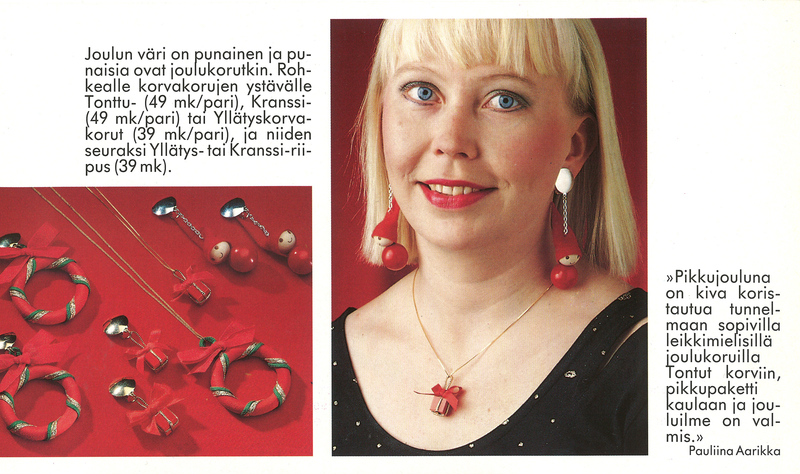 The jewellery of summer 1987. 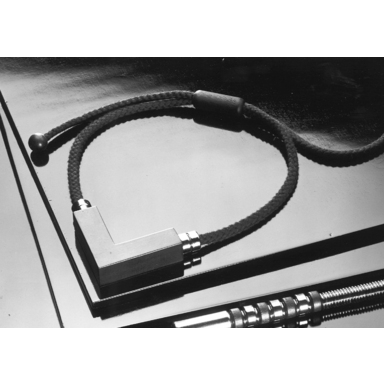 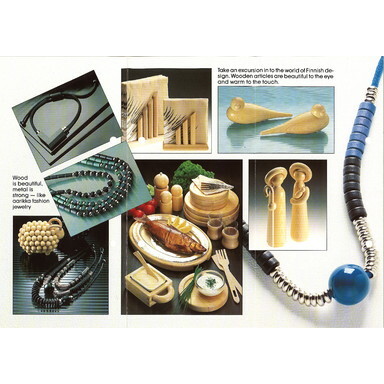 The Viva birch necklace, 1986. 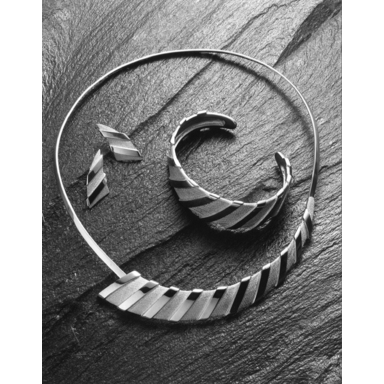 The typical round forms of the Aarikka jewellery gave way to the post-modern, angular forms favoured in the 1980s. 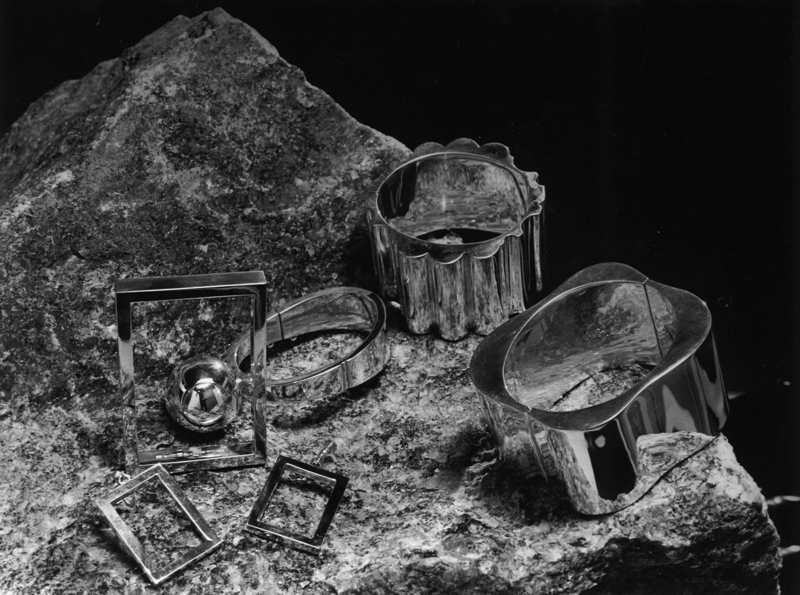 In addition to squares and triangles, the jewellery featured chrome-coloured details and high-gloss paint. 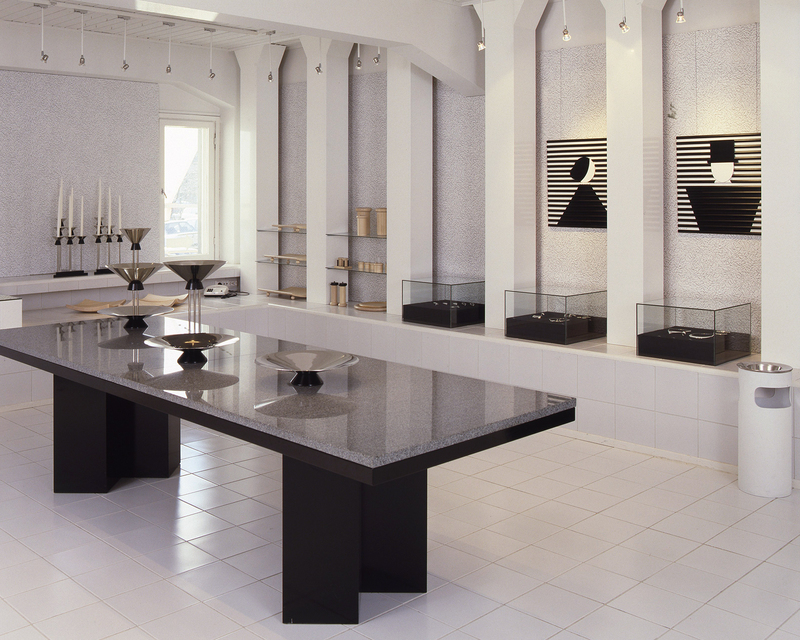 The most extravagant pieces of jewellery sold well in the United States. 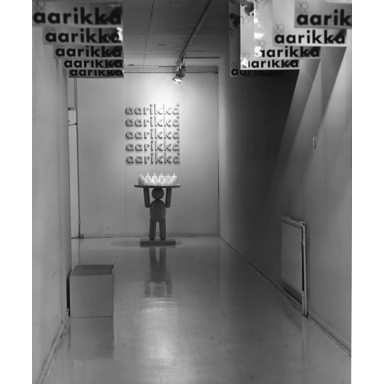 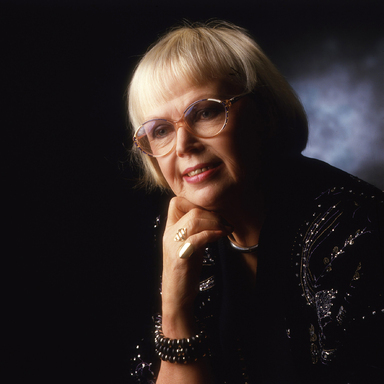 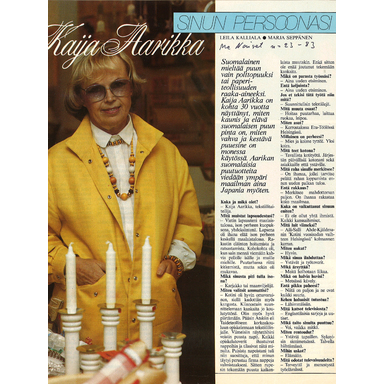 In 1989, Pauliina Aarikka made her debut as Aarikka’s jewellery designer at the company’s 35th-anniversary exhibition. 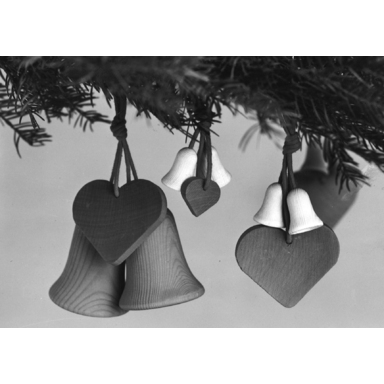 The playful Christmas jewellery that she designed soon became a hit. 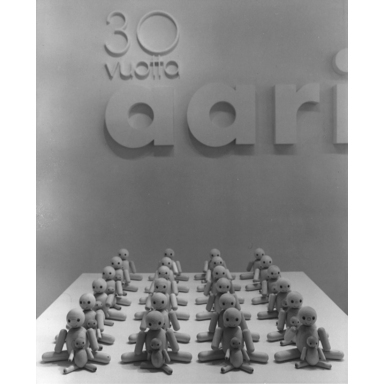 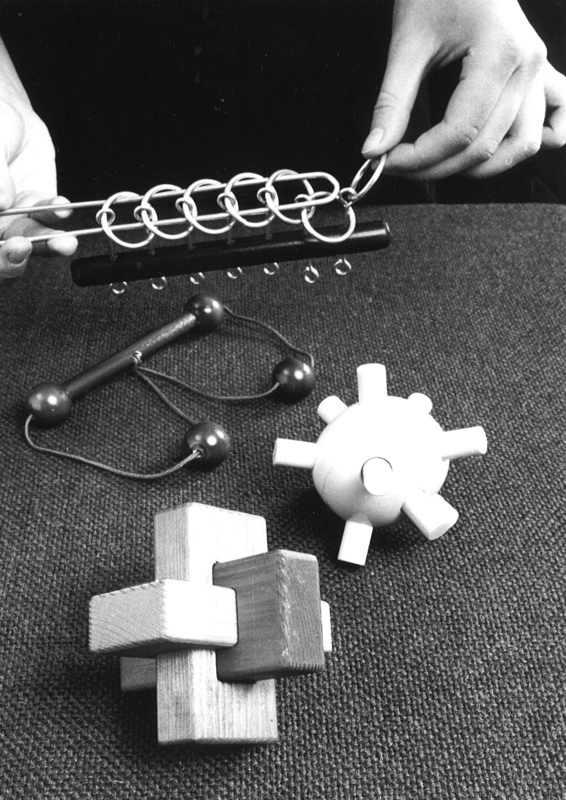 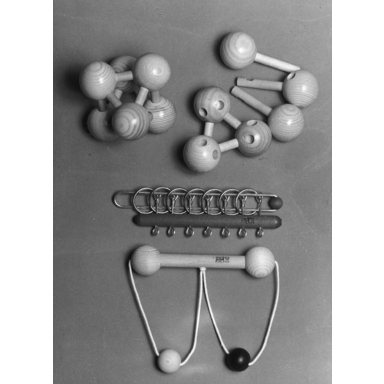 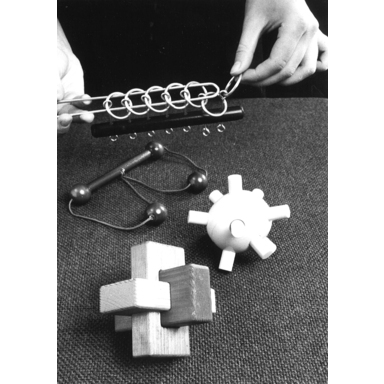 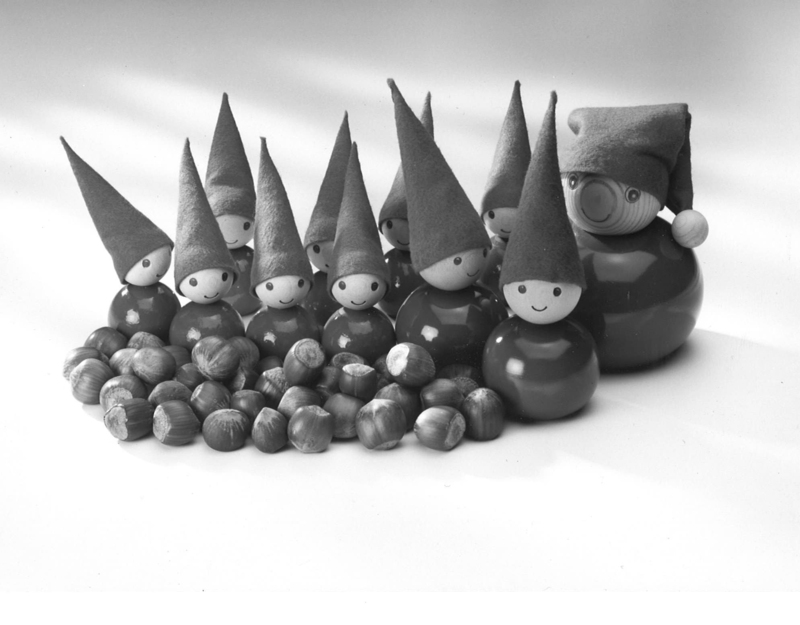 Toys have been part of Aarikka’s product range since the 1960s. 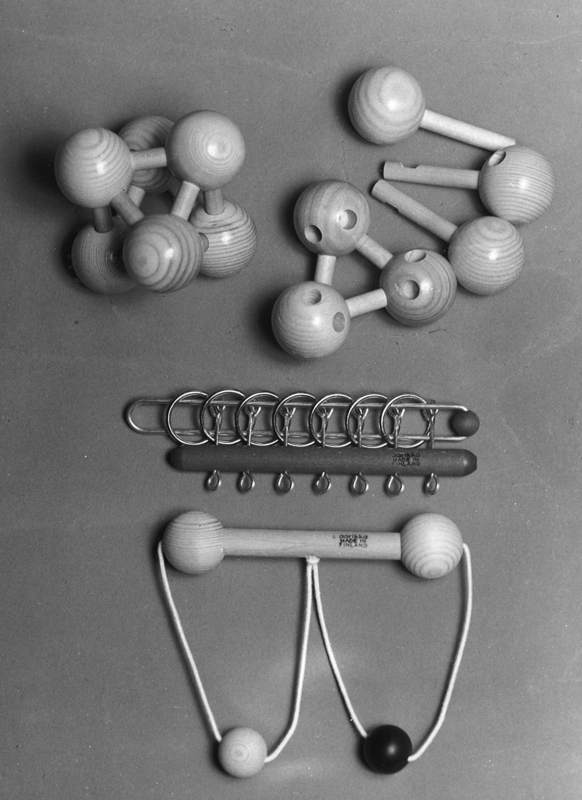 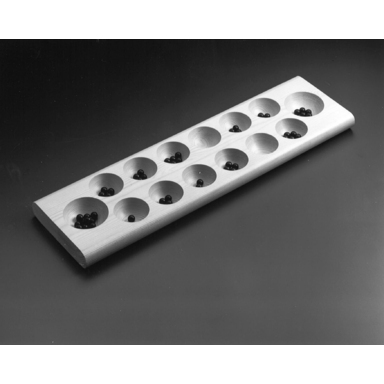 From 1978, adults too have been entertained with our products. 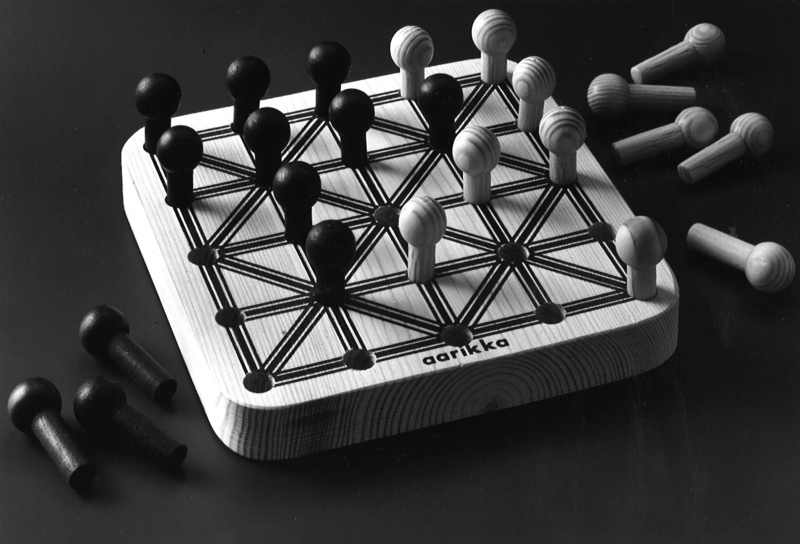 Naturally, Aarikka decided to craft the classic games, such as Palloshakki, Erakko, Pasianssi, and Värisuora, from wood. 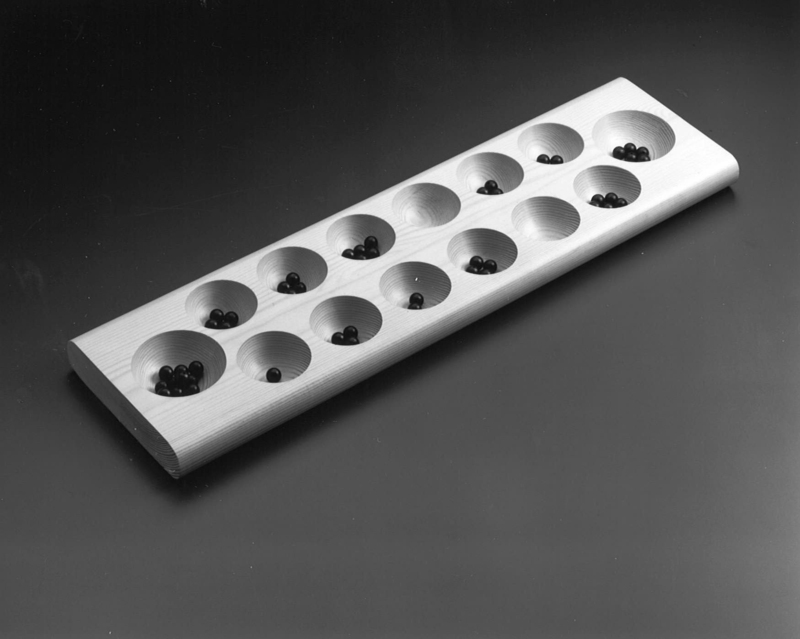 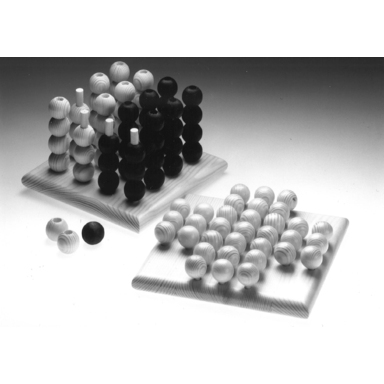 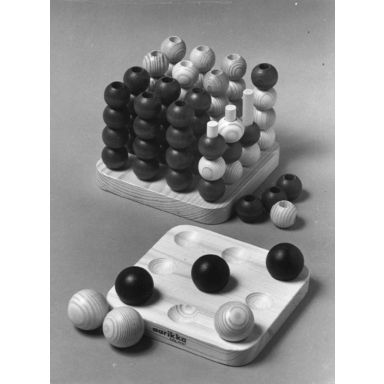 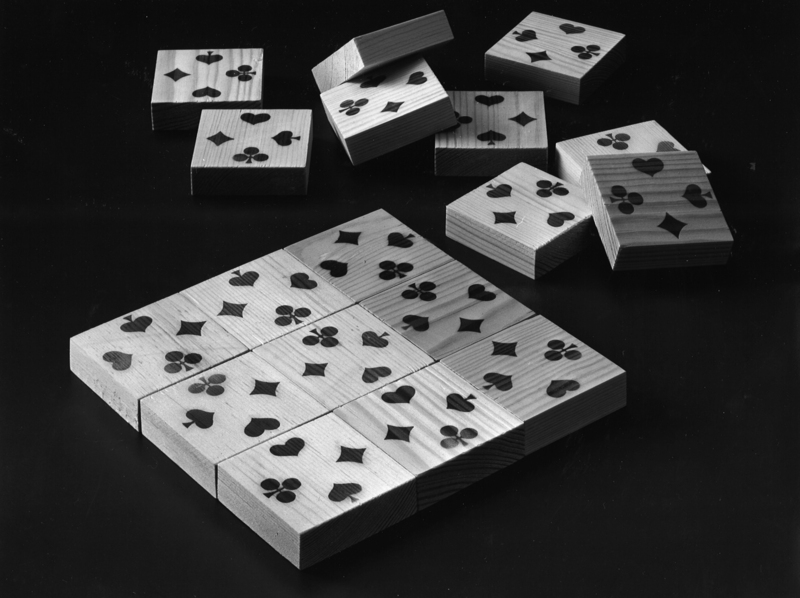 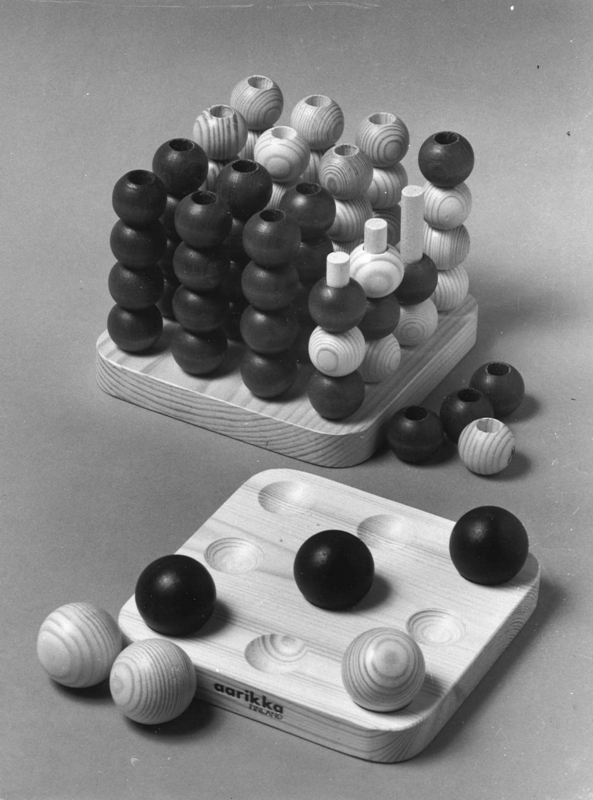 The biggest favourite proved to be the Palloshakki game, of which Aarikka created variations in various sizes. 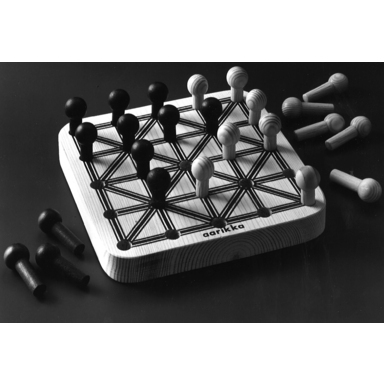 The tricky puzzle games designed for adults – Vanginlukko, Atomi, and Nopsin – brought a challenge to everyone. 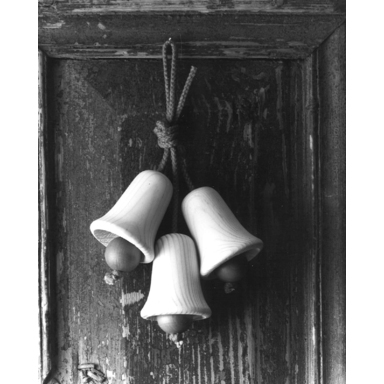 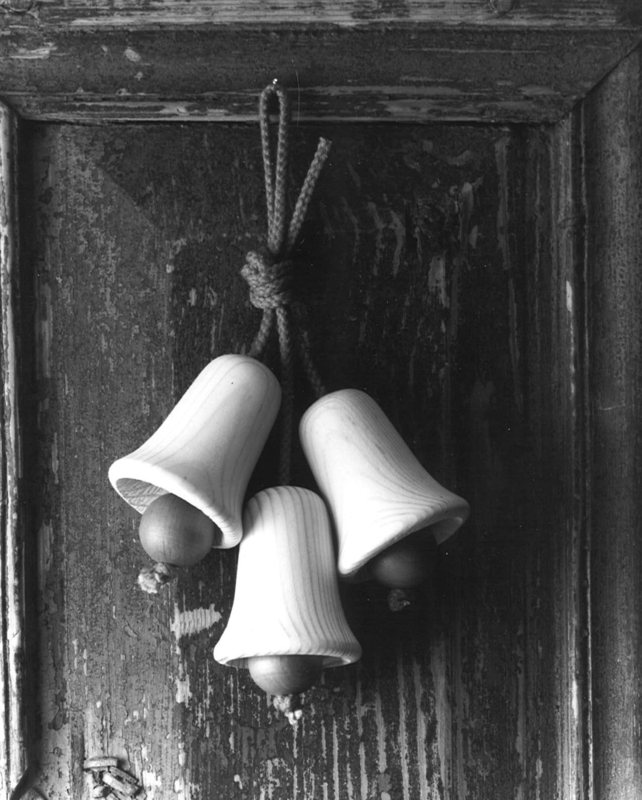 Bell ornament for doors, 1980. 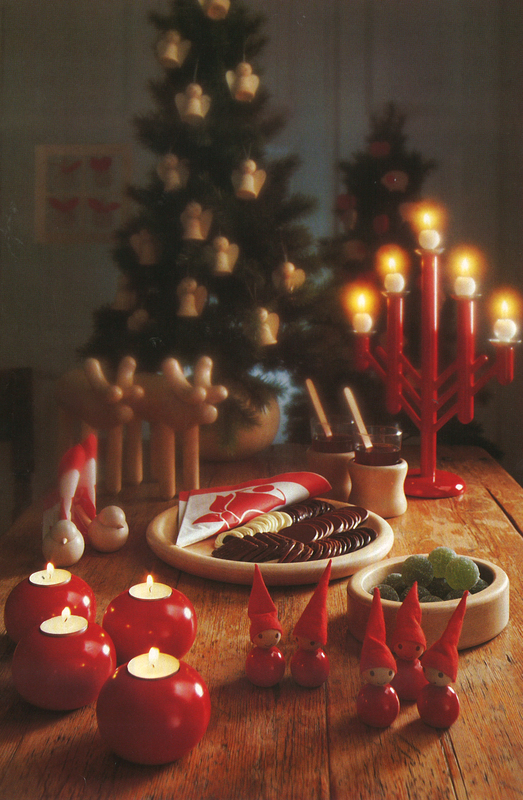 Elves appeared in Aarikka’s product range in the 1980s. 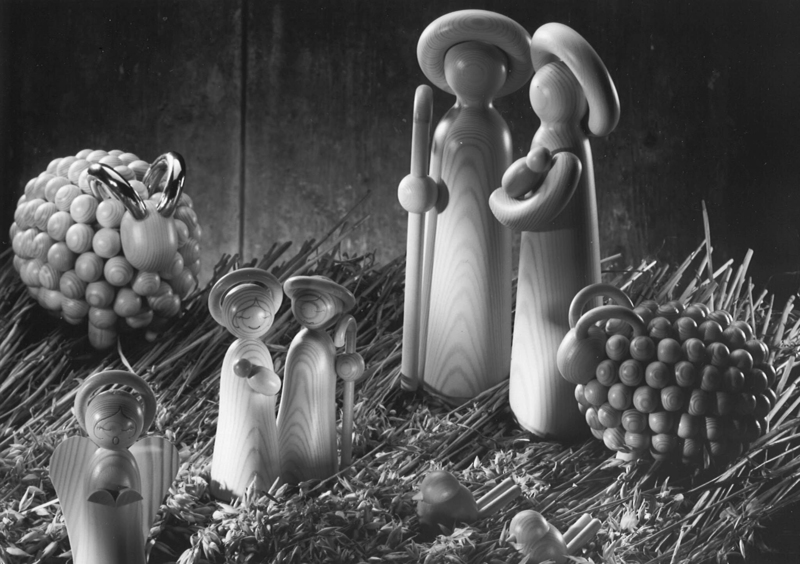 Wooden figures in a crèche display. 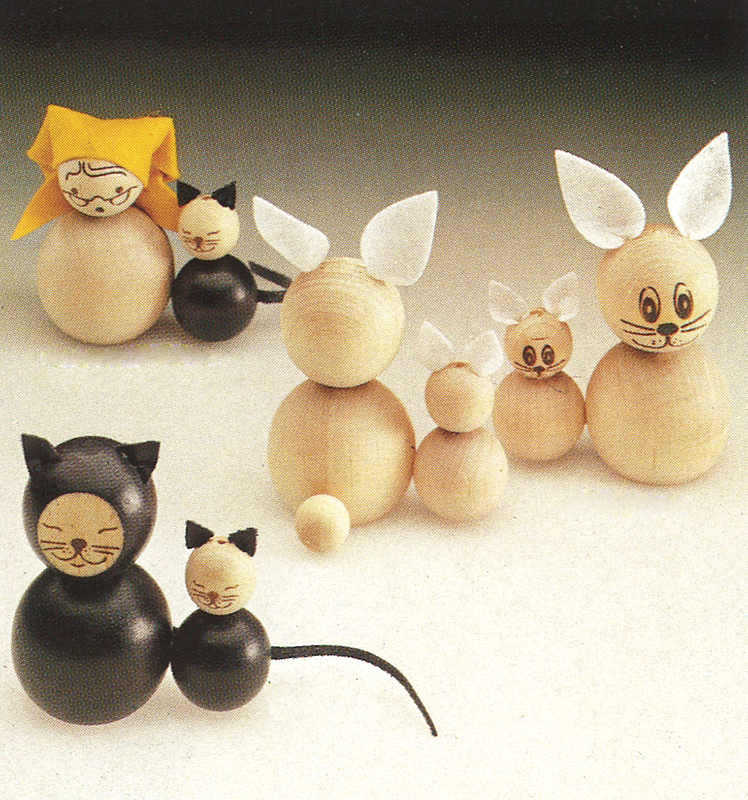 Kittens, mother hare, and little witch, 1985. 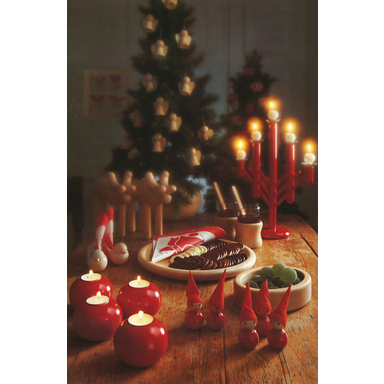 Aarikka has been making Christmas ornaments and decorations since the 1970s, and in the 1980s these established themselves as a permanent part of the product selection. 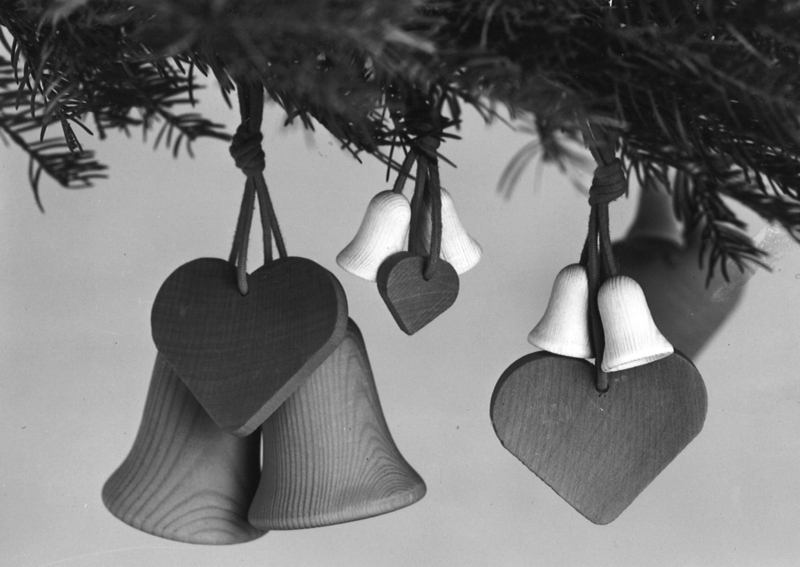 First came the Christmas bells and elves. 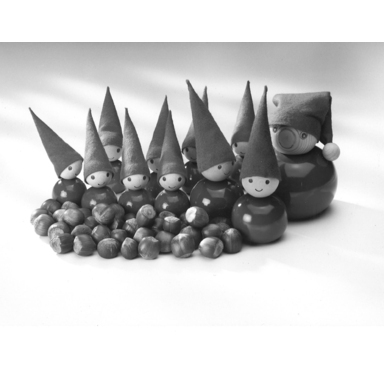 Then it was time for a choir of angels to join the red-hatted elf team. 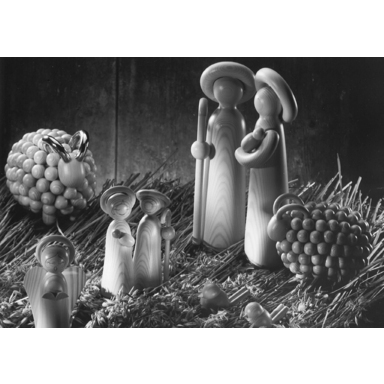 Kaija also designed a nativity scene, which was warmly welcomed in such places as France and Germany, where there is a long tradition of such decorations. 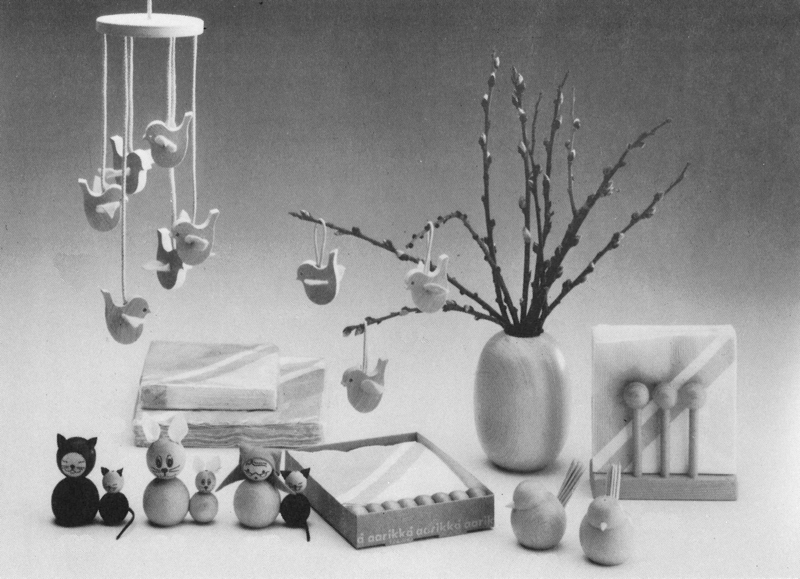 Alongside Christmas emerged another important period for seasonal sales, Easter, with its chicks, bunnies, and wooden eggs.